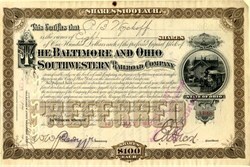 Beautiful certificate from the Baltimore and Ohio Southwestern Railroad Company issued in 1891. 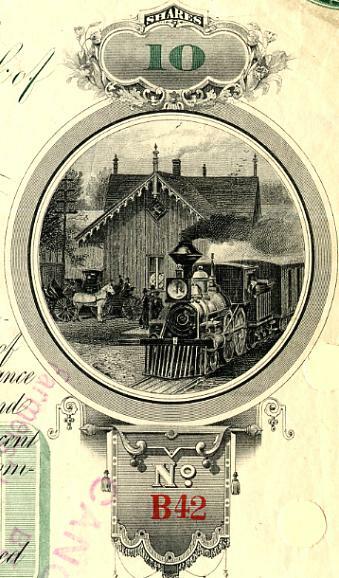 This historic document was printed by American Bank Note Company and has an ornate border around it with vignettes of a train passing a station, and a dog. This item is hand signed by the Company's Officers and is over 115 years old. The Cincinnati and Baltimore Railway Company was incorporated September 4, 1868. The Cincinnati, Baltimore and Washington Railway Company was incorporated February 16, 1883. This company was formed to take the Marietta and Cincinnati Railroad on judicial sale of that road, taking the above name. The Baltimore Short Line Railroad Company was incorporated September 9, 1870. The Ohio and Mississippi Railroad Company was incorporated in Indiana, February 14, 1848. This incorporation was recognized by the Legislature of Ohio with the same powers as granted to railroad corporations in the State, act of March 15, 1849.